The Italian section of the Society of Plastics Engineers (SPE) announces its first a wide-ranging plastics Technical Conference, a meeting opportunity for industry, professionals and researchers in the Plastics field. ICMA will give a speach on the use of co-rotating extruders for mixing purposes. 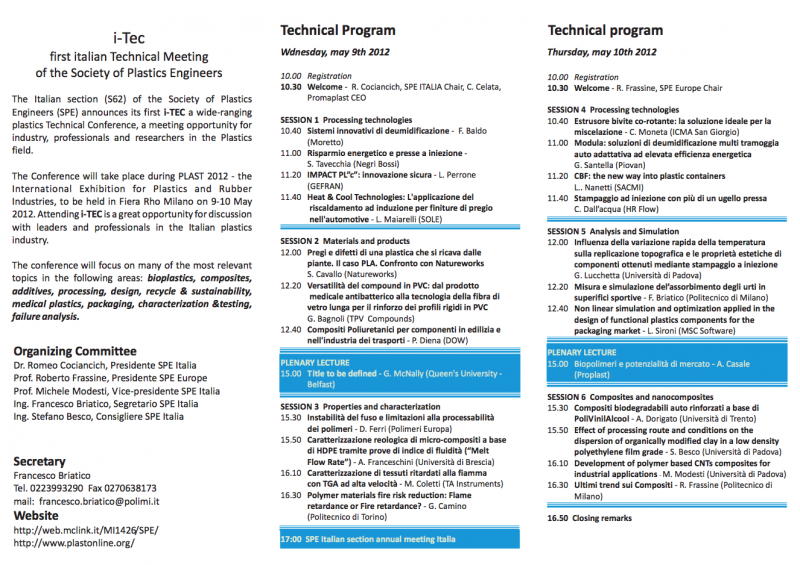 The Conference will take place during PLAST 2012 - the International Exhibition for Plastics and Rubber Industries, to be held in Fiera Rho Milano on 9-10 May 2012. Attending is a great opportunity for discussion with leaders and professionals in the Italian plastics industry. The conference will focus on many of the most relevant topics in the following areas: bioplastics, composites, additives, processing, design, recycle & sustainability, medical plastics, packaging, characterization &testing, failure analysis.